Image caption The fire service say it was fortunate no one was injured. 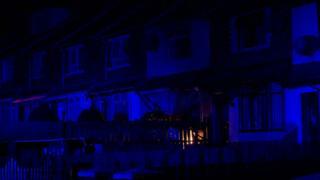 Around 10 homes in north Belfast were evacuated for several hours after a fire and gas explosion. The Northern Ireland fire service received a call at 18:25 BST to reports of a home on fire at Farrington Gardens in Ardoyne. As the fire crews were tacking the blaze an electrical cable was damaged which then sparked and ignited gas causing an explosion. No one was injured and the families have since returned to their homes. Station commander Dave McComiskey said it was "very fortunate" there were no injuries. "The gas explosion caused extensive damage to the property blowing the front doors and the front window out into the front garden where the fire service was working. "A couple of fire fighters we're blown off balance by that but thankfully no one was injured."